Abstract: Buffalo Technology have produced some very versatile and fast memory DIMMs with the one thing that every consumer is looking for; competitive prices. With the release of Intel's 800 MHz FSB processors, and accompanying motherboards, the enthusiast market has boomed as consumers have rushed out to buy newer, faster components. For enthusiasts, the name of the game is change, and if they don't adopt new technology they could be missing out on the full potential of their existing hardware. Buffalo Technology is not as familiar a memory brand as say Corsair, or Crucial, yet the company has been quietly creating a following for itself. That following amongst enthusiasts has largely been driven by Buffalo's high speed memory. Buffalo Technology have produced some very versatile and fast memory DIMMs with the one thing that every consumer is looking for; competitive prices. Remember the Winbond BH-5 based Buffalo PC3700 DDR memory PCstats reviewed previously? In that review we weren't quite able to hit its official 466 MHz rating, but with its economical price and good performance results, all is forgiven. Now if you're an enthusiast, especially with a Pentium4 800 MHz FSB computer, you'll no doubt need some high speed memory. With many enthusiasts running their systems past 300 MHz FSB, finding good memory to complement a heavily overclocked PC can be difficult. Buffalo Technology must have looked into the crystal ball and realized this, for they have just released some very exclusive DDR533, or PC4200 DDR memory! It's amazing how fast DDR RAM has ramped in the last little while. For the first two years, DDR RAM was stuck at what seems forever at PC2100 speeds, and now in the last few months we've seen PC3700, PC4000 and now PC4200 speeds released. 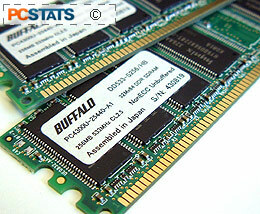 Buffalo use Hynix PC3200 HY5DU56822BT-D43 DRAM memory modules on the PC4200 DIMMs, and according to Hynix, those TSOP-II chips are rated to run at 200 MHz FSB with a voltage between 2.5V-2.7V at 3-3-3-8 timings. Buffalo thinks differently and they claim that their PC4200 modules can run at 266 MHz while maintaining timings of 2.5-4-4-8. Buffalo don't mention anything about voltages, so I'm just going to assume those speeds go hand in hand with a 2.6V JEDEC PC3200 standard voltage - though it could be 2.5V just as easily. I would have liked to have had some RAMsinks on the memory modules, not so much to keep them from bursting into flames, but more so to protect the DRAM from potential ESD damage. Ramsinks make for much easier handling, and let's not forget about the coolness factor too. AMD users please take note here, this memory is not designed specifically for your PCs as the latency of the memory is high. Yes, I know there are AMD users who can run their FSB's in excess of 250 MHz, but the performance hit due to the lax timings will negate any benefit of running at a higher FSB. Pg 2. Boosting the MHz way up!